"Hag." redirects here. 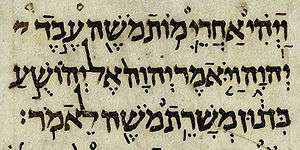 For rabbinic text Ḥag., see Hagigah. The Book of Haggai is a book of the Hebrew Bible or Tanakh, and has its place as the third-to-last of the Minor Prophets. It is a short book, consisting of only two chapters. The historical setting dates around 520 BCE before the Temple has been rebuilt. 520 BCE falls between the start of the Achaemenid Empire in 539 BCE and 520 BCE, a period that saw major leaders such as Zerubbabel help lead the Jews in their return to the land. The Book of Haggai was written in 520 BCE some 18 years after Cyrus had conquered Babylon and issued a decree in 538 BCE allowing the captive Jews to return to Judea. Cyrus saw the restoration of the temple as necessary for the restoration of the religious practices and a sense of peoplehood after a long exile. Haggai's message is filled with an urgency for the people to proceed with the rebuilding of the second Jerusalem temple. Haggai attributes a recent drought to the people's refusal to rebuild the temple, which he sees as key to Jerusalem’s glory. The book ends with the prediction of the downfall of kingdoms, with one Zerubbabel, governor of Judah, as the Lord’s chosen leader. The language here is not as finely wrought as in some other books of the minor prophets, yet the intent seems straightforward. The first chapter contains the first address (2–11) and its effects (12–15). ↑ Coogan, Michael D. "A Brief Introduction to the Old Testament." Oxford University Press, 2009. o. 346. ↑ Towner, W. Sibley. The Harper Collins Study Bible. HarperCollins Publishers. 2006. p. 1265. 1 2 3 4 Achtemeier, Paul J., and Roger S. Boraas. The HarperCollins Bible Dictionary. San Francisco, CA: HarperSanFrancisco, 1996. Print.